County championship: Wells and Brown go big - but can Sussex force win? Luke Wells and Ben Brown both made big hundreds as Sussex piled on the runs against Glamorgan on the third day of their Specsavers County Championship match at Hove. Wells scored 181 and Brown an undefeated 159 as they shared a partnership of 294 in 73 overs, the second-highest for the fifth wicket in Sussex’s history. But a turgidly slow pitch still looks like being the only winner. After declaring with a first innings lead of 217 on 552 for 5, Steve Magoffin trapped Nick Selman lbw in the seventh over but Mark Wallace and night-watchman Owen Morgan saw Glamorgan to 30 at stumps, 187 behind. Glamorgan paid a heavy price for dropping Wells on 56 when he was missed at second slip by Aneurin Donald off Tim van der Gugten. He didn’t offer a chance thereafter as he reached his third hundred of the season. Brown gave him excellent support as he rediscovered the form which brought him 1031 Championship runs in the first division last season, but their task was made easier by a surface on which batting was relatively straightforward. Wells said: “It was nice to put a partnership together which has given us a good lead and hopefully the chance to win the game. “It’s a slow wicket so it was hard work. You didn’t feel threatened that you were going to get out but scoring runs was tough so it was nice to put our egos away and build a big lead. I have felt in pretty good form all season and this was my third hundred now. I want to keep the form going and put together a really consistent year rather than just playing well in patches. Brown added: “I have made most of my career hundreds batting at No6 and it’s the place where I want to bat, especially as it gives us the chance to play five specialist bowlers. “I wanted to get a score and help us build a big lead but it probably went better than we thought it would. Glamorgan plugged away but their fast-bowling spearhead Mick Hogan was restricted to ten overs as he continued to recover from mild concussion when he was hit on the helmet on the second day. 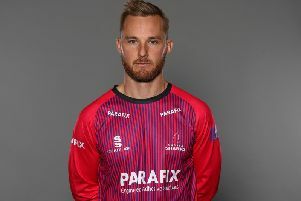 Graham Wagg did remove Luke Wright for 19 when the Sussex captain lost his off stump playing no shot but Sussex accumulated remorselessly after that as they set a new record for any wicket against Glamorgan, beating the 281 by John Langridge and Harry Parks at Eastbourne in 1938. Wells guided van der Gugten through the vacant slip area for his tenth four to reach his century and Brown got to his off the last ball before tea when he cut slow left-armer Morgan to the point boundary. As Wells inevitably tired towards the end of an innings which ended four minutes short of seven hours, Brown upped the tempo after tea as Sussex sped towards their declaration. A dab to the third man fence took him to 150 for only the second time in his career. Wells then struck a straight six – only the 16th of his career – before offering a sharp return catch to Morgan off the next ball. Wells’ 181 came off 343 balls and he also hit 18 fours. Brown’s 159 not out was only four short of his career best and came off 292 balls with 15 fours and a six. With skipper Jacques Rudolph nursing a badly-bruised hand, Glamorgan’s 46-year-old coach Robert Croft was among five substitute fielders employed.